Add a touch of style and glamour to any outfit with this versatile necklace from Thai artisan Chayo. 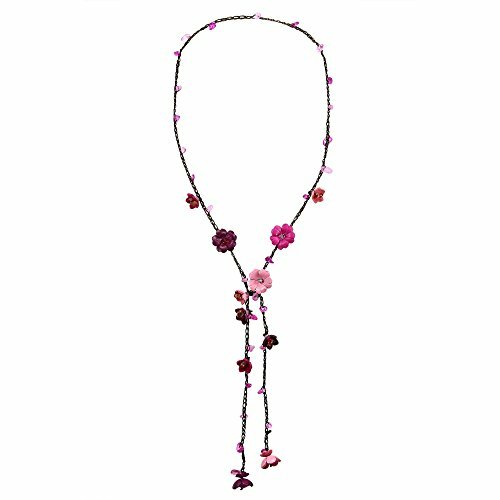 Inspired by the vibrant tropical flowers that grow near his home in Thailand, this creation features a bouquet of colorful flowers made with genuine leather on cotton wax rope. This extra-long necklace is then studded with contrasting colored glass and fashion crystal giving this piece a truly tropical chic vibe. (This piece comes in a variety of colors to choose from). Versatile enough to be worn as a wraparound bracelet or as a multi-wear necklace, this amazing accessory is sure to look great with whatever you pair it with. PLEASE NOTE: The handcrafted nature of this product will produce minor differences in design, sizing and weight. Variations will occur from piece to piece, measurements may vary slightly. ARTISAN STORY: Chayo first experiences with leather goods came at a very early age where he helped his father in their family business. Chayo's father was the local leather tanner for his village. As his experience grew, Chayo began designing various accessories with leather, such as key-chains, belts, hair clips and more. Chayo has unique leather designs in various colors and styles and attributes his creative inspiration to the beautiful landscapes of his homeland, Thailand. Includes an official 'AERAVIDA Fair Trade Sourcing' Card with certified Seal of Authenticity. If you have any questions about this product by AeraVida, contact us by completing and submitting the form below. If you are looking for a specif part number, please include it with your message.